North Raleigh Tree Service has the experience, expertise and the right equipment to handle any Raleigh tree removal project. Homeowners throughout the area have consistently relied on us to clear their lots, remove a diseased or downed tree or thin out their yard. We know you are looking for a Raleigh professional that will work quickly and leave your yard in good condition, so that you can get back to enjoying your property. We have the capability to remove growth that may be standing next to a home or business. Our team has specialized equipment and can complete the job with the precision required to keep your property safe. 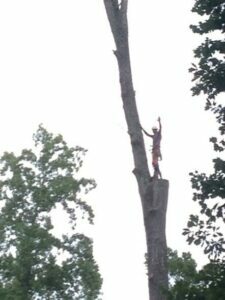 We do not recommend attempting any tree removal on your own. 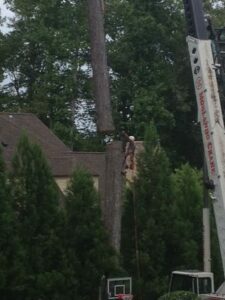 Often hidden dangers that only a trained tree removal company can safely address are encountered. There is nothing better than knowing your job is in competent hands and that it will be completed quickly and safely. We are a licensed and professional company that is a Better Business Bureau Accredited Raleigh Tree Removal Company. Taking pride in our work is what we do, with 100% customer satisfaction. Contact us today for more information about our Raleigh tree removal services or call (919) 808-CHOP/2467.